Monday afternoon and a very good welcome from the guv. We sat in the little front room and watched the world go by, then decided to stay a bit longer as the heavens opened up for a quick and very heavy shower. Late afternoon visit and fairly quiet. We sat in the little bar at the front which we had to ourselves. 40p CAMRA discount or 50p discount for anyone with a Senior Concessionary Bus Pass. My first visit to this charming pub. I sat in the little bar at the front and only discovered the upstairs (and some friends who were sat there) when I was searching for the facilities and about to leave. Old Dairy - Über Brew 3.80 Badged as Über Hop. Golden. Very high hop levels and a long, bitter finish. Mad Cat - Santa Paws 4.50 A dark Winter Ale; quite heavily-spiced. Mid afternoon visit friendly welcome and one other customer at the bar. We sat in the corner room at the front. Old Dairy - AK 1911 4.00 All of my 5 a day in a pint glass. Scaffolding outside made the pub look closed but a handy sign outside saying business as usual encouraged us to cross the road and enter the pub. Camra discount was offered without having to ask. Fairly busy downstairs but we had the upstairs seating area to ourselves. Shepherd Neame - HMQ Celebration Ale 4.50 Full bodied traditional copper bronze coloured ale brewed to celebrate the 90th birthday of Her Majesty the Queen. Available in pubs during June 2016. 12:00 First ones in, and had the pub to ourselves until we left. My first visit. As it was quiet I had the opportunity to have a good look around including upstairs, using both staircases of course. Lovely quirky building. Friendly welcome and good beer. Old Dairy - Cattle Shed 4.50 Good example of an American Pale Ale. 7.30pm Popped in for a quick half whilst waiting for a friend. 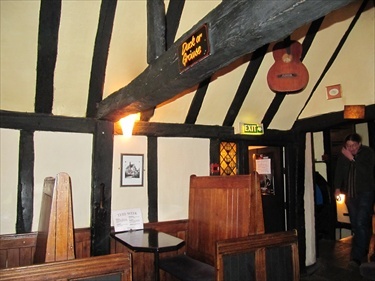 The pub is found in Maidstone, Kent, ME15 6LP. 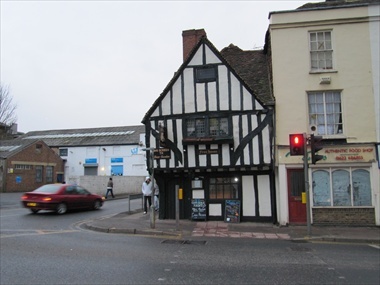 15th century building, but has only been a wine bar, then pub in recent years. The upstairs bar is ideal for those who want to escape from fruit machines, etc. CAMRA discount for card carrying members. We have visited this pub 69 times, seen 138 different beers and tried 86 of them.